Quictent SILVOX® CT serie is the flagship serie among all pop up gazebo series. It covers all sizes and colours that we have now. 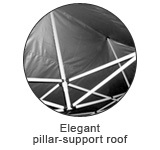 Pop up gazebos in this series have a pyramid roof supported by central pillar(s). Maximum height is different from each size. They also feature in wheeled bags. 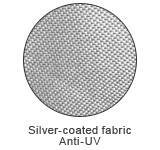 Silvox®, adopting unique workmanship that silvers the high density Oxford, is owned and registered by Quictent. 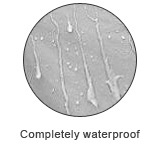 Silvox® fabric is lightproof, waterproof, UV-resistance and fire-resistance to some extent. Pyramid-roof | Black | Max. 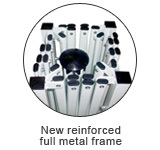 Height 2.8m | Steel Frame | Waterproof and Anti-UV. Pyramid-roof | Green | Max. Height 2.8m | Steel Frame | Waterproof and Anti-UV. Pyramid-roof | Navy blue| Max. Height 2.8m | Steel Frame | Waterproof and Anti-UV. Pyramid-roof | Green | Max. Height 3.25m | Steel Frame | Waterproof and Anti-UV. Pyramid-roof | Red | Max. Height 3.25m | Steel Frame | Waterproof and Anti-UV.